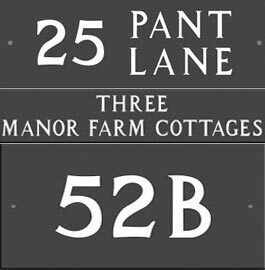 These polished very dark grey slate house signs and numbers are hand engraved using a router which makes the traditional V-cut lettering style. 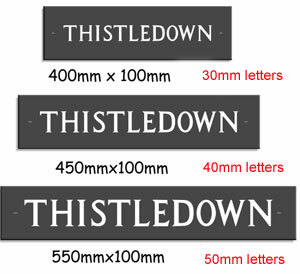 The letters sizes available are 30mm, 40mm and 50mm. The slate is 10mm thick. 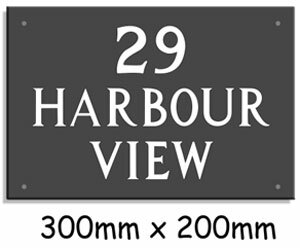 Signs are available either 100mm high or 200mm high. Length depends on the number and size of letters - see the charts below. The letters are painted white and holes are included in the price. Also available in green slate. 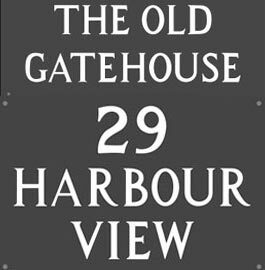 As the font type and size, colour, spacing and layouts are all standard, these signs can be dispatched quickly and are very good value for money. 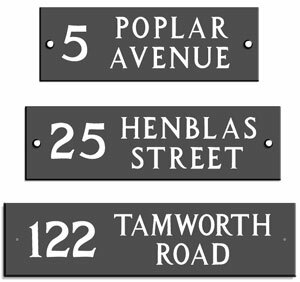 If you require a more individual sign please click here for options. 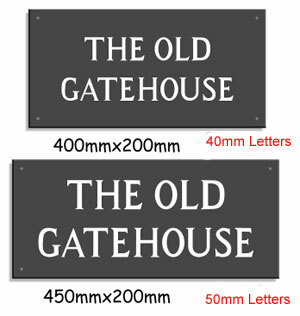 Note that the length of a sign may vary by approx 50mm depending on the actual letters in the house name. 7 x 50mm 300mm 12"
8 x 50mm 350mm 14"
9 x 50mm 350mm 14"
10 x 50mm 350mm 14"
11 x 50mm 400mm 16"
12 x 50mm 400mm 16"
13 x 40mm 450mm 18"
14 x 40mm 450mm 18"
15 x 40mm 500mm 20"
7 x 30mm Letters 300mm 12"
7 x 50mm Letters 350mm 14"
8 x 50mm Letters 350mm 14"
9 x 50mm Letters 400mm 16"
10 x 50mm Letters 400mm 18"
11 x 50mm Letters 450mm 18"
12 x 50mm Letters 500mm 20"
8 x 40mm Letters 350mm 14"
10 x 40mm Letters 450mm 18"
4 x Letters & 3 Numbers 250mm 10"
5 x Letters & 3 Numbers 300mm 12"
6 x Letters & 3 Numbers 300mm 12"
7 x Letters & 3 Numbers 300mm 12"
8 x Letters & 3 Numbers 350mm 14"
10 x Letters & 3 Numbers 400mm 16"
13 x Letters & 3 Numbers 450mm 18"
Most of our signs are sent by courier and a signature will be needed. We can send the parcel to your works address..
or use search bar above. Ask us for a Free Quote. Made in the UK. Our team at The Sign Maker looks forward to helping you with your sign.